“The end of the year and Christmas, with the inevitable hype to buy more ‘stuff’, a ritual commercialized binge with precious little good will, but especially tough for those living on the margins. And not too flash for the rest of us if we have a conscience.Barely a day goes by without news of the latest religious-based outrage or ‘natural’ calamity hitting the poorest and most vulnerable. “I couldn’t face a ‘normal’ Christmas this year so what’s left of our family is going to a pub. I reckon it’s a good idea for all activists to switch off for a few days to give our overwrought minds and bodies a break, spending time with family and friends and a drink (or two) to talk frankly and nut out what we can do. As George Orwell said: ‘If liberty means anything at all, it means the right to tell people what they do not want to hear.’ And spare a coin for those with nowhere to live. “There’s certainly plenty to get cranky about, both at home and abroad. 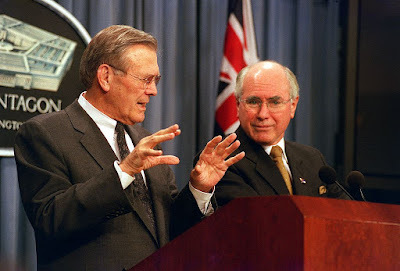 How disgraceful that war criminal John Howard is on the record for regretting nothing about his time as PM, even for his part in the destruction of Iraq, whereas ex-British PM Gordon Brown at least has the grace to claim that Britain had been ‘hoodwinked’ and ‘duped’ by the yanks into joining that despicable war, especially by that monstrous former defense chief Donald Rumsfeld. “A recently released secret US intelligence report has cast doubts of ‘WMD claims’ as if we didn’t already know. Many Brits now believe that Blair should be prosecuted as a war criminal for his role in the catastrophe, but no-one here suggests the same for Howard, which doesn’t say much for us. There was one dissenting voice against the WMD claim, Dr David Kelly, and look what happened to him. “Dr Kelly had worked as a senior weapons inspector at the British Ministry of Defense and knew a great deal about Iraq’s weapons systems. He voiced his concerns to the BBC anonymously, stating that the intelligence was being manipulated, but his cover was blown as the source of its report. In July 2003, the 59-year-old British expert was found dead in a lonely wooded area in Oxfordshire. ‘Suicide’ officialdom claimed. ‘In a pig’s ear’, was the public response, backed up by the ambos who were first on the scene and stated categorically that Dr Kelly had not been killed where he was found. He’d been murdered in another place. “While Syria, Russia, Iran and Turkey are trying to revamp peace negotiations, the US prefers war in its quest for greater global dominance. Pentagon chieftain James Mattis stated that US military forces would be ‘digging in further on Syrian territory’ and was furious when Turkey disclosed that the Yankees already have 13 military bases there. The yanks are also scaling up their presence in Afghanistan and Iraq as part of a regional buildup with ominous signs that Saudi Arabia and Israel are ramping up hostility towards Iran and Lebanon, rather like chucking a lighted match into a petrol tank. “Washington’s most recent hit list of high priority enemies to attack, weaken and overthrow are predictable - Russia (too powerful), China (too powerful), North Korea (has a bomb), Venezuela (too independent), Iran (too independent), Syria (want to corral it), Cuba (too independent) and Lebanon - with ‘lower level’ adversaries Bolivia (too independent) and Nicaragua (too independent) on the waiting list. But the US can carry on all it likes about Russia’s evil ways and its ‘interference in America’s internal affairs’, but it cannot counter Russia’s influence in the Middle East nor its expanding trade with Asia, especially China. Yemen, Cuba, Lebanon, Bolivia and Syria are more vulnerable. “The US can push for a total Saudi victory over the devastated, starving, cholera-stricken people of Yemen, the Arab world’s poorest country where an appalling humanitarian crisis is taking place. While not dropping bombs and organizing an invasion like it has in Iraq and Syria, the US is complicit in Yemen’s destruction by providing intelligence, weaponry and political and military support to Saudi Arabia. Around 40,000 Yemeni children have already died this year as a result of severe acute malnutrition with 130 children dying each day. Where is the international outrage? “It is always with relief that I turn to Cuba, despite my concerns about its future with nutcase Trump in the White House, but it seems to be doing OK. According to a report in Cuba Libre, there is widespread restoration projects taking place in my beloved Old Havana along with major works along the Malecon. “Since the late 1990s, neighborhoods have spawned new small businesses, barbershops and auto repairs, food stalls, street vendors, along with the inevitable bars and restaurants, with some ambivalence about the impact all these individual enterprises are having on the Cuban psyche. A nudging of social inequality resulting from the increased income for some in a socialist cultural economy that shares public resources with everyone. Although I was pleased to read that all small businesses have to be licensed, with a primary requirement that each venture must provide a social service to their local neighborhood. In every case, the applicant must meet with local reps to discuss and agree on what projects will be provided, which will then be monitored by the local CDR (Committee for the Defense of the Revolution). “Despite some changes and severe limits on resources, Cuba’s streets are clean and kids are happy, a nation where Cubans ‘work together, laugh together and dance together’ while continuing to enjoy free health care, free education, no rent and affordable public transport and with music and art in abundance and available to all. That’s my sort of society. Viva Cuba! "Almost half of the population of Qatar immediately prior to the oil era were foreigners--Baharians,Iranians and Africans...The population, which stood at approximately 28,000 in 1939, had probably fallen to 25,000 during the years of World War II...In 1939 roughly half the population lived in Doha, the capital city...Roughly 39 percent of the entire (Qatari) population...in 1939 were foreigners. Of these, 6,000 were Negroes who had been originally slaves; rather than leave Qatar, they continued to live there...The number of Persians who settled in Qatar grew in the 1920s, and by 1939 there were an estimated 5,000 living in Qatar." 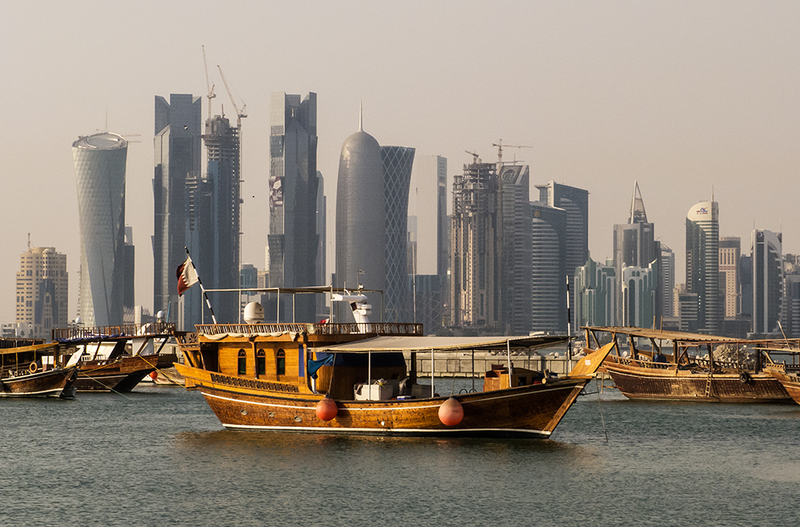 "...Around 7 out of 8 workers were non-Qatari in 2007. Most laborers are men in their twenties and thirties from South Asia. The number of women brought to Qatar as expatriate workers is much lower...There were only about 30,000 Qataris in the early 1960s...Qatari labor sponsorship law...requires all non-Qataris to be sponsored by a Qatari citizens, who has control over their status, visa, conditions, salary, and potential expulsion..."
UK's `Guardian' Newspaper: Sponsored By U.S. Power Elite's Ford Foundation? Most people in the UK and USA don't think that super-rich families in the USA should be able to avoid paying their fair share of taxes by setting up "non-profit" multi-billion dollar foundations like the Ford Foundation, which obtain funds for their "charitable grants" by investing in for-profit hedge funds and transnational corporations that still exploit workers and consumers around the globe in the 21st-century. "Theguardian.org is chaired by John Paton, founder and former CEO of Digital First Media and a member of the GMG Board of Directors....It is run by Rachel White, president of theguardian.org, who is also the Guardian’s global EVP of philanthropic and strategic partnerships...."